There are plenty of things Bostonian’s do different than the rest of the world. They pronounce o as aw, and ah as aw, and ar as aw; they seem to really prefer the aw sound. When stop lights turn green, they ‘bang a left’, instead of giving the folks going straight the right of way. They call soda pop, tonic, and they go Candlepin Bowling. 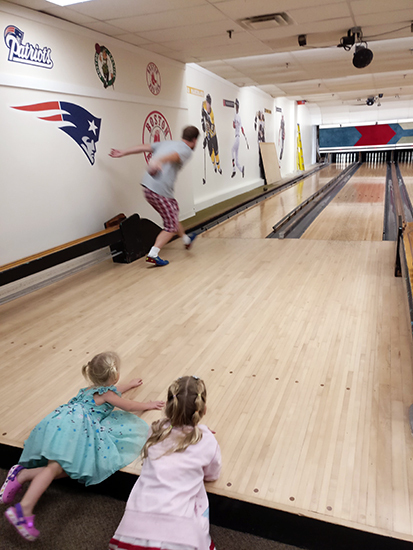 Candlepin Bowling is a mixture of standard 10 pin bowling and skee ball. It requires the force of standard bowling, with the technique of skee ball, or something like that. We loved playing this version of bowling! Well, I should say, the kids and I did. Gabriel is a bit of an amateur bowling expert – he has his own ball and specially fitted shoes. He struggled with not using his spin hook technique as he threw the ball down towards the pins, which typically landed him one of side of the lane, instead of square down the center. For me, I loved being able to lob the ball as fast and furious as I was able, and I did pretty good if I say so myself. Typically, I come in behind the twins in scoring, but I scored the highest out of our entire family in Candlepin Bowling! Invented in 1880 in Worcester, Massachusetts, Candlepin Bowling was developed before both 10 pin and duck bowling. Thus, it is the original version of bowling. 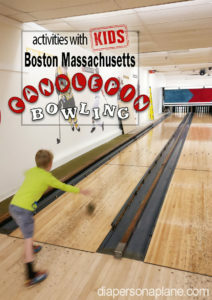 The three main differences in Candlepin Bowling are the type of pins, the balls used, and the number of tries you get. Candlepin Bowling pins are like giant matchsticks. There are 10 pins, straight, tall, and lighter than 10 pin bowling pins. 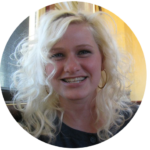 They fall flat down, and don’t create a domino effect. The way to hit multiple pins down is by aim and centrifugal force. 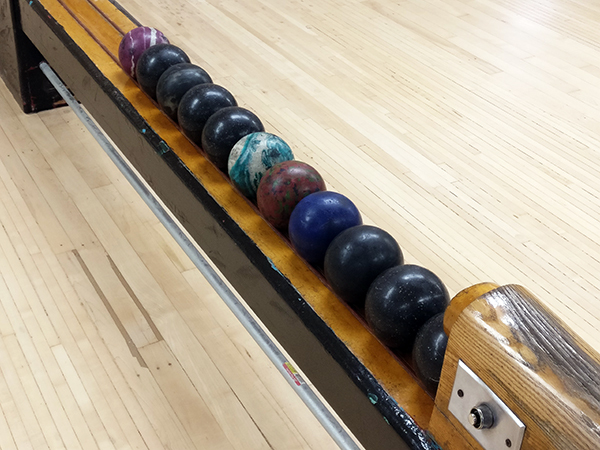 The balls used in Candlepin Bowling are much smaller than 10 pin bowling balls. They vary in weight and color, but are small enough to be held easily in one hand. They also do not have finger holes. Just pick it up and chuck it hard. Instead of two attempts for each turn, with Candlepin Bowling you get three tries. We had to wrap up our session because a league was coming in, but before we left we had the privilege of watching a pro score a few turns. He went as fast as he could to grab the balls, and threw them down one after another. 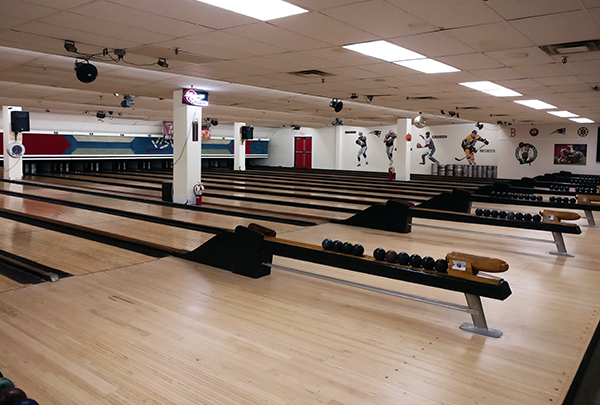 A strike is when all 10 pins are knocked down on the first try. A spare is when all the pins are knocked down on the 2nd try, and adds 10+ to your next round. No one has ever scored a perfect 300 in Candlepin Bowling. 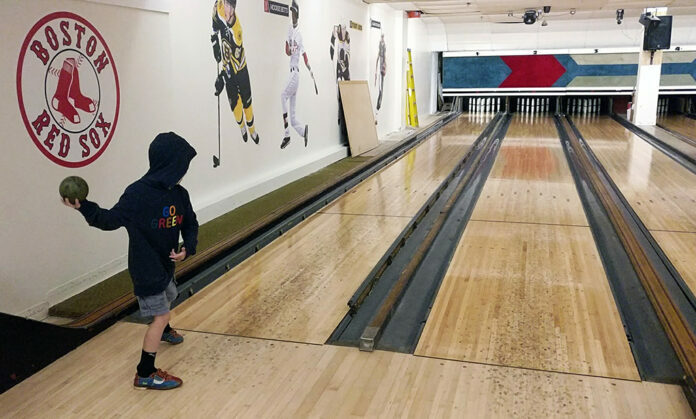 ► For Kids: Candlepin Bowling will be right up their alley! The balls are much more manageable for tiny hands, and the weight makes them easier to throw. We opted to have the bumpers put up, and that was a great assistance (for all of us, let’s be honest). 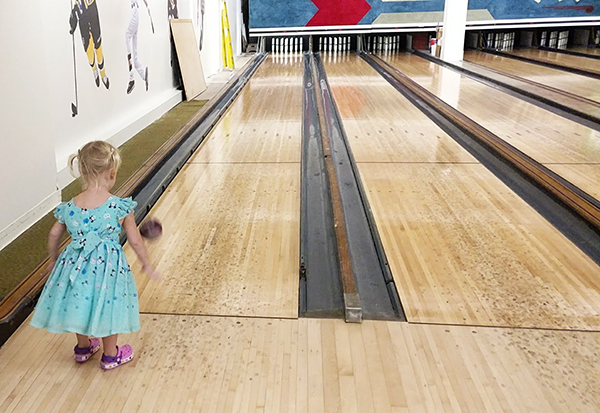 There is a slight dip at the end of the lane which can cause the ball to roll back up the gutter if it doesn’t have enough force to keep it headed towards the pins. We ended up with quite a few balls in the gutter despite the rails. 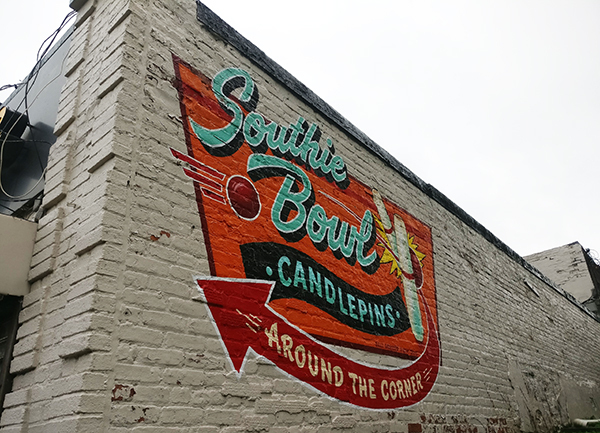 Have you been Candlepin Bowling? What about Duck Bowling? 5 pin Canadian Bowling? We had no idea anything other than 10 pin existed! 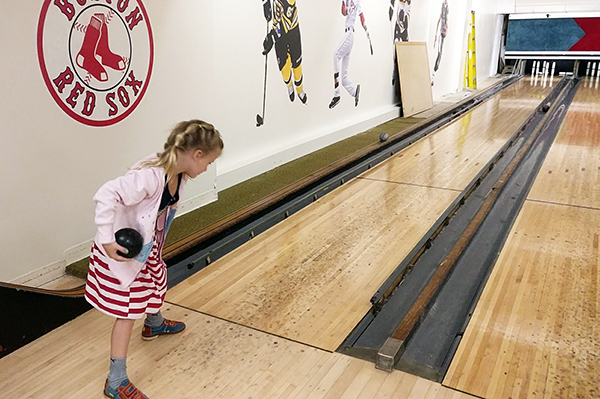 These different styles of bowling have opened up a whole new world of sports to us since our trip to Boston. We’re definitely going to have to check out every single one of these versions. 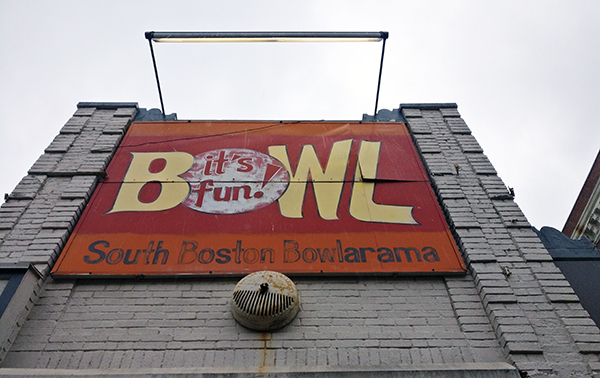 Southie Bowl was a great destination for kids. They were laid back and low key. They had a small selection of arcade games, plus some refreshments. They didn’t end up charging us for the shoes or the socks, and they had no problem with our baby wearing her regular shoes. Check this place out on your next trip to Boston! ► Nap-Time Version: A run down of the Boston way to bowl. Check out our other activities in Boston, including the Freedom Trail, the kids first college visit to Harvard, what it’s like riding the ancient Subway system from 1776.